Fantasy sports betting is growing rapidly and a major platform in the forefront of this is MVP Lineup. Cryptocurrency based fantasy sports betting is very popular and MVP Lineup gives you the opportunity to win in Bitcoins. MVP Lineup is one of the very few trusted fantasy sports betting sites that are available even for betting enthusiasts living outside the US. NBA and NFL are the sports currently available for daily fantasy sports betting, along with MVP Dice, which is also one of the much sought after fantasy betting platforms. The ability to use Bitcoin is certainly appreciated by many daily fantasy sports bettors all over the world. We can also expect other forms of cryptocurrencies in the future from MVP and that should make things more exciting. DFS, as it is shortly termed, has stormed the US with its exquisite fantasy betting and there are several leading betting sites that have created a revelation. MVP Lineup with Bitcoin integration has spiced things up, giving an opportunity to bettors all over the world to get their hands on DFS. MVP Lineup daily sports betting website is a Bitcoin exclusive site and all your earnings will be in Bitcoin, which is the most exciting aspect. Bettors can instantly sign up and start placing bets on MVP, since there is no need for obtaining any kind of gaming commission license. NBA, NFL and Dice games on an integrated Bitcoin platform is offered here. We can expect MLB to be added to the lineup real soon, which should raise your expectations further. All you got to do is sign up, form your team and enter the contests with your team of players. Make sure to choose the best players who are going to play in the match scheduled for the day. Based on the performance of your team player in the game, you will get points. Teams with many players doing well on the day will get maximum points as a team. Based on the prizing model, you will earn bitcoins. Different tournaments that provide multiple winning probabilities are offered in MVP Lineup. In a tournament, top 20% are considered to be winners and if you are part of it, then you will get points. 50-50 tournaments declaring the top 50% contestants as winners is also a good bet. New players can participate in beginner tournaments and get a feel for the game. Daily fantasy sports betting are made fair and enjoyable by MVP. Any sports betting platform will become popular only if the user interface is friendly. An intuitive, easy to operate web interface is provided by MVP Lineup. Theme and overall graphics of the website are clean and precise. You can sign up and start betting without any fuss whatsoever. All the information you need is well laid out. Contests and tournaments that are available and the entry fee for every single one of them are listed clearly. Site design truly is spectacular and provides the best platform to enjoy daily fantasy sports betting. As mentioned earlier, signing up for a player in MVP is very simple. Just enter your email address and create your own username and password. Unlike other betting sites, this lets you login to your account without any email confirmation. MVP is a Bitcoin enabled DFS platform and this gives you maximum privacy. You need not enter your personal details anywhere during the sign up process. Only MVP Lineup site members are allowed to take part in DFS tournaments. MVP Lineup is a Bitcoin integrated fantasy sports betting site and if you’re familiar with Bitcoin, then you will not have any doubts regarding the payment process. All your Bitcoin earnings in the currency equivalent will be displayed at the top end of the site. All the other values that you find elsewhere will be Bitcoin based. Deposits for starting the game are made easy with one step confirmation. Withdrawals need 6 confirmations and this gives you payment security. Winners of an event get their earnings credited to their account within 24 hours of the event, if they had made a withdrawal. If you are a big bucks withdrawer then you need to wait for a couple of days since it needs to go through multiple security verifications. Unlike many other betting sites that lure you by advertising about promos, bonuses etc. nothing of that sort is entertained by MVP Lineup. Beginner’s area is offered for new players to try out their gaming skills for free. Every tournament requires you to make an entry fee in Bitcoins to take part in it. The fees are kept low in order to minimize betting impacts. 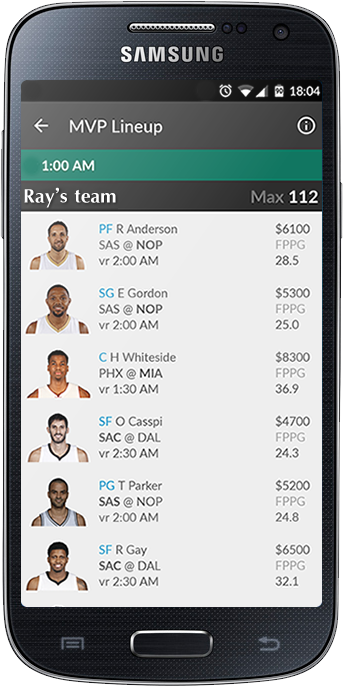 Bettors can even enjoy DFS at MVP Lineup using the official Android MVP app on their smartphones and tablets. This app provides the same betting experience like the MVP browser, which should keep you excited. MVP Lineup is offering you an email address to raise your grievances. Group chat is also available for members, which will let you interact with other players. You can also check out the social media page of MVP for updates and other information. Lack of promos, bonuses and other offers. Live chat customer support is missing. Daily Fantasy sport betting alone is offered. Lack of multiple sports betting. MVP Lineup is one of the best Bitcoin integrated daily fantasy sports betting platforms available for gaming enthusiasts at the moment. If you are someone who loves to stay away from the ordinary and love exciting betting, then MVP should be your betting zone. We can expect some great updates and things will only go upwards from here; so MVP members are in for a treat without a doubt.